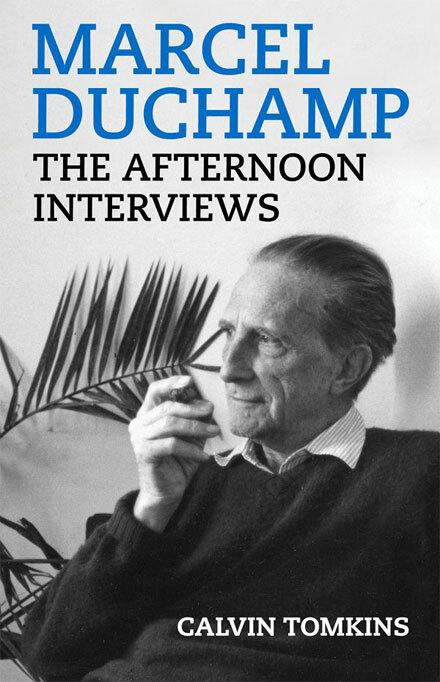 I just completed the book, “The Afternoon Interviews”, a republishing of interviews by Calvin Tomkins of Marcel Duchamp. The beginning of the book is a current interview with Tomkins and Paul Chan from 2011 where Tomkins recalls his introduction to Duchamp. The second part of the book are the republished interviews with Duchamp from the late 50’s and early 60s. Calvin Tomkins has been a staff writer for the New Yorker since 1960. He continues to report for them, and lives in New York City. I was first introduced to him after reading his book Off the Wall: A Portrait of Robert Rauschenberg. Basically he was in the privileged seat of chronicling the art scene in New york starting in the 60s through today. I don’t believe there is a living US critic with more history in making art lingo and goings on comprehensible to the masses. It turns out that Tomkins was actually a foreign correspondent at Newsweek when he was asked in 1959 to interview Marcel Duchamp. He said this was a surprise to him as at the time he “knew nothing whatsoever about art.” My word – about to meet the mind and art bender that is Duchamp with no bearing points? Come to think of it, this is likely the best way to meet and talk to Duchamp. I highly recommend reading this book. The interviews reveal his matter of fact discussion of art, his evolution as an artist and the general art of the time. Since often schools of thought surrounding Duchamp’s art practice can get utterly confusing, Tomkins’ reflections and the interviews are essential to understanding his work.